Some good news for India has been pouring in from the Himalayan front since the beginning of the year; and bad news too. The landing of an Antonov-32 AN-32 transport aircraft of the Indian Air Force (IAF) at the new Pakyong airport in Sikkim could be a game changer for the Indian Army. Pakyong airport is located nearby the strategic Chumbi Valley in Tibet, the Siliguri Corridor …and Doklam. A few days earlier, defence minister Nirmala Sitharaman complimented the Border Road Organisation (BRO) for constructing an important portion of the Kailash Manasarovar route near India’s Nepal border in Uttarakhand: “A very crucial milestone has been achieved on January 15, 2019, by connecting Lakhanpur to Najang by BRO. This connectivity is very important being the chicken neck corridor with India’s Nepal border in Dharchula Sub-Division of Uttarakhand, where the only alternative route was a mule track,” the minister tweeted. But at the same time, China is not sleeping. In fact, it remains far ahead of India in terms of infrastructure development. According to Xinhua news agency, the Tibet Autonomous Region’s (TAR) objective is to build and upgrade 4,500 km of rural roads to link all its townships and villages by the end of 2019. “The move is expected to contribute to the ongoing poverty reduction campaign, especially in Tibet’s one township and 12 villages that still lack access to roads,” affirmed Xinhua. And, since all infrastructure is now legally-bound to be “dual-use”, it means that the People’s Liberation Army will greatly benefit of the 37 billion yuan (about $5.5 billion) invested in 2018, which included building and upgrading 13,000 km of rural roads. By the end of 2018, the TAR already had a total of 68,863 km of rural roads giving access of asphalt or concrete roads to 34 townships and 533 villages. But more worrying information is coming from the plateau, a new axis or corridor is being built between Tibet and Nepal, the closest ever from the Indian border in Sikkim. It is a fact that connectivity and border trade between Nepal and Tibet has greatly increased in recent years. According to Tibet Business Daily, the total value of Tibet’s foreign trade exceeded 5.8 billion yuan in 2017. “The domestic economy has been steadily improving, and the demand for the international market has generally recovered,” noted the daily. Lhasa customs data showed that the total import and export value of Tibet’s foreign trade was 5.885 billion yuan in 2017, adding 13.9 per cent from the same period in 2016. Has India been informed? Probably not! The main investment has been the land port of Kyirong at India’s Nepal border. Though the railway line between Shigatse and Kyirong has been delayed by at least three years due to the 2015 earthquake, it is now the main channel for land trade between China and Nepal, after the Zangmu Port was closed following the earthquake. On June 9, 2018, the civil aviation administration of China announced that Tibet will soon have three new airports. 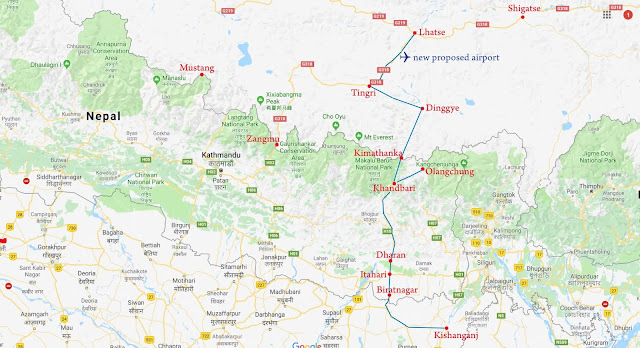 A look at the location of these airports shows their strategic importance — one will be located in Lhuntse in Lhoka area, north of the Upper Subansiri and Tawang districts of Arunachal Pradesh; the second in Purang, near the trijunction of Nepal-Tibet-India, north of Pittoragarh district of Uttarakhand (on the yatris’ route to Mt Kailash); and the last one between Tingri and Lhatse counties of Shigatse City. Local villagers are worried. Ganesh Adhikari, the chief district officer of Sankhuwasabha, told the Post, “The Arun river has already changed its course.” But this area seems to be the only piece of flat land available on the Nepali side where Kathmandu plans to build new customs offices, an immigration point, a border outpost and quarantine and banking facilities. Kimathanka will be the landport of the north-south corridor linking Kimathanka with Biratnagar via Khandbari; Biratnagar is the second largest town in Nepal and a key communication centre, already served by an airfield located not far from the West-East Mahendra Highway. Once the new corridor is opened, it will have serious implications for India as it will open via Birarnagar, a new strategic and unwanted gate to India, to Kishanganj …and Siliguri. In case of a Chinese offensive via the Chumbi Valley and Sikkim, it could facilitate the PLA’s movements and allow an outflanking of the Siliguri corridor. China may also one day attempt to open up a corridor to Bangladesh probably via Kishanganj, to support a Bangladeshi regime inimical to India, but it is trickier. In March 2018, the same newspaper mentioned the construction of Olangchung Gola Highway, which will link the far eastern part of India’s Nepal border to the border point with TAR; it could become a branch of the Kimathanka corridor. The Nepali government has allocated `600 million for the project. Delhi needs to vigilantly watch and start asking questions to Kathmandu. India cannot afford another Doklam situation. This article New dangers along the border for India appeared in The Asian Age/Deccan Chronicle last week.